Fairfield is the highest mountain for hiking by the town of Grasmere in the Lake District of England. The image below is from just north of Grasmere, at the large layby next to the A591 road that runs between Keswick, Grasmere, Ambleside, and Windermere, with free parking for many cars. There are also 3 large pay parks in Grasmere village. The main route up onto the mountains is up the road to the left dow there, or up the road at the Swan Hotel further on. That is 2,007ft Heron Pike that is normally the first mountain to be hiked on the route to Fairfield. The image below is from the same car park looking to Heron Pike, Stone Arthur and the 2,523ft Great Rig. The 2,864ft Fairfield is to the left of Great Rig. You cannot really see Fairfield from here. The paths to Heron Pike and Stone Arthur start from the same place, so many hikers go up Heron Pike, go north to Great Rig, north to Fairfield, then return to Great Rig, then back down over Stone Arthur. The image below is of the Swan Hotel with the road there also leading up to the mountain trail. The car park here is the hotels, so should only be used if you are using the hotel for lunch and drinks after the hike. The image below is of the narrow road just up behind the Swan Hotel that leads up to the mountains. This path is well marked, so is easy found from the road up from the free car park, or from the Swan Hotel. The image below is from the top of the narrow road looking at the gate onto the mountain range. The trail to the right leads up to Heron Pike. The trail to the left leads up to Stone Arthur and Great Rig. The image below is from close to the top of Heron Pike, looking back down over Alcock Tarn, Grasmere, and Grasmere Lake. That is the Old Man of Coniston out to the left, and the Langdale Pikes out to the right. Large Image. The image below from Heron Pike looking north to Great Rig and Fairfield. This is a fairly straight forward hike along the top. Hart Crag and Dove Crag are more rocky if you venture out there. The image below is from Great Rig looking north to Fairfield. This is a nice steady hike from here to the top. The image below is of the top of Fairfield Mountain. This is the highest point on this range. The 3,117ft Helvellyn can be seen in the distance. There is a big drop and two other mountains to cross if you hike out to there. Large Image out to Helvellyn from the North Side of Fairfield. To the right in this image below is the 2,759ft St Sunday Crag that leads down into Patterdale. You have to cross the dangerous Cofa Pike to get onto that mountain though. Large Image of Cofa Pike. Most hikers that visit Fairfield return back down one of the south or west routes. The image below is of the route back down over Great Rig and Stone Arthur to Grasmere. 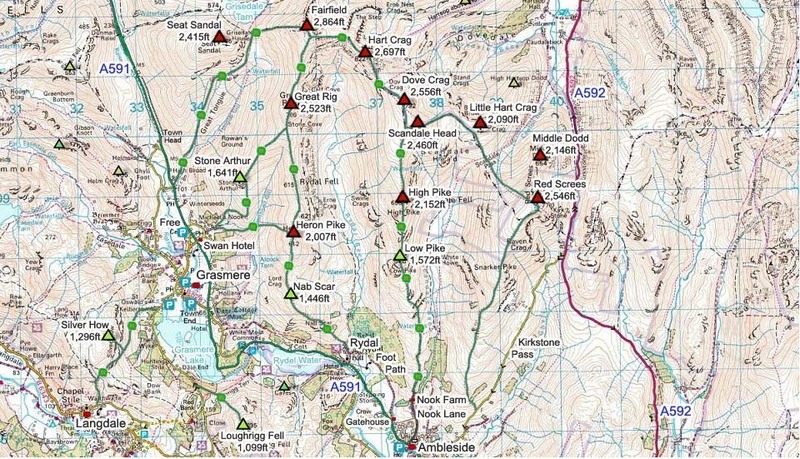 The Fairfield Map below shows the main routes onto the mountains from Grasmere, Ambleside and Rydal. Doing the loup round the horseshoe and over High Pike is normally done from Ambleside. Fairfield Horseshoe from Ambleside Photo Tour.